Point Reyes Bird Observatory -- now known as Point Blue Conservation Science -- works to understand how healthy ecosystems function and to reduce the harmful effects of climate change. For example, in the Farallon Islands (pictured here courtesy of Marty Knapp), scientists recorded dramatic alterations in ocean currents during 2005 and 2006. What followed was a decline in tiny marine organisms called krill on which seabirds feed. For two years, the disappearance of krill led to a complete breeding failure of Cassin’s Auklets. The light of Point Reyes, California found its poet in photographer Marty Knapp. For 30 years Marty has been capturing the light and weather, shadows and shapes of this dramatic land and seascape north of San Francisco. 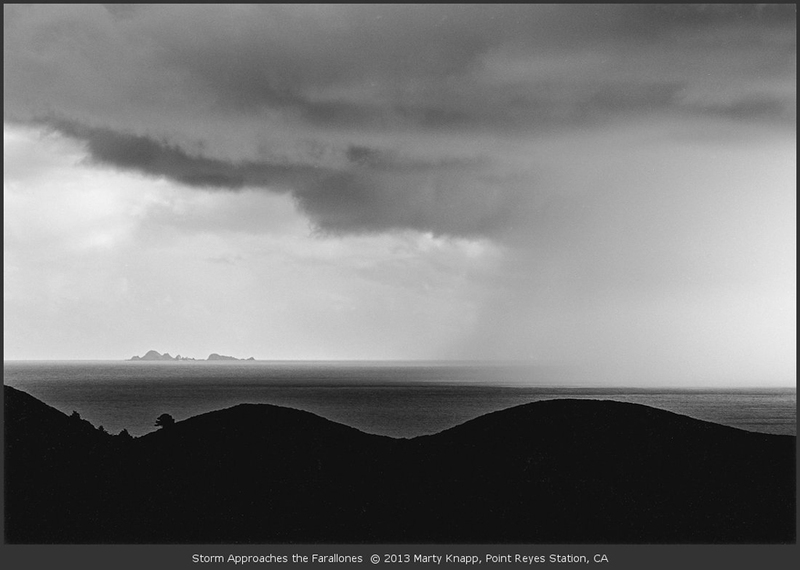 In one composition, Marty portrays the turbulent beauty of a storm bearing down on the Farallon Islands, and the birds that live there. For decades, PRBO Conservation Science, founded as Point Reyes Bird Observatory, has been studying Common Murres, Auklets and other birds here. They’re documenting the birds’ response to environmental change. In 2005 and 6, for example, scientists recorded dramatic alterations in ocean currents. What followed was a precipitous decline in tiny marine organisms called krill on which seabirds feed. For two years, the disappearance of krill, led to a complete breeding failure of Cassin’s Auklets. Today, [bring up delicate wave with Glaucous-winged Gulls] PRBO works from Antarctica to Alaska to understand how healthy ecosystems function and to reduce the harmful effects of climate change. They’re applying their knowledge of birds to the environmental challenges of today. At birdnote.org, you can find links to the photography of Marty Knapp and to PRBO, which this June, changed its name to Point Blue Conservation Science. Bird sounds provided by The Macaulay Library of Natural Sounds at the Cornell Lab of Ornithology, Ithaca, New York. Colony of Common Murres  recorded by M. Fischer. Check out Marty Knapp's online gallery! PRBO is changing their name to "Point Blue"